Teach students all about sublimation and dry ice, also called solid carbon dioxide, in a fun way! Students will find it to be a fun science experiment which they can conduct both at home or school. 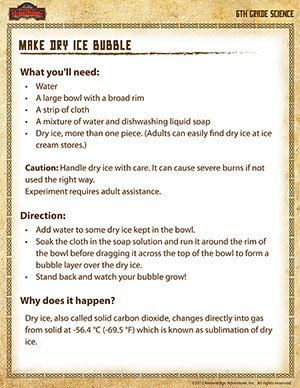 Making dry ice bubbles can be an interesting idea for a science project as well. Teach 6th graders more about the composition and states of dry ice from this online science resources. Don't forget to have a look at other such interesting science experiments too!